September is huge for me for a lot of reasons: the school year begins which is when my job changes gears dramatically, my husband’s birthday, and I LOVE the fall. 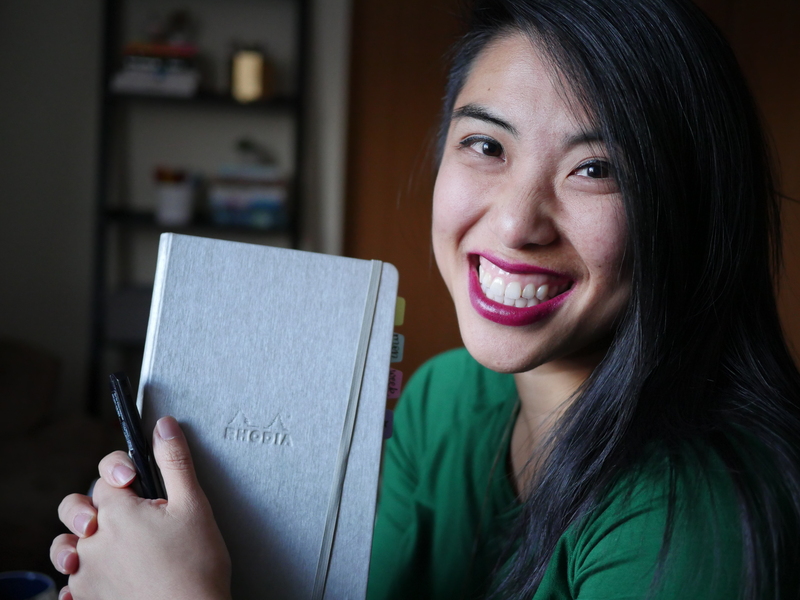 I have been using my Bullet-Dori system (a Bullet Journal inside a Midori, haha!) since May, so this is my first go at a semester with my new planner. Here’s how I’ve set it up as a long version of the #PlanWithMeChallenge. After a while I learned that I loved having the different components in one place, hence the Traveler’s Notebook setup. Isn’t this purple beautiful?? For me it’s a great balance between soft and firm – some covers are very soft and “floppy” and others are very stuff. But this one has just enough give to be sturdy. I’m using 3 inserts inside, integrating my personal and work life. Inside, I have 2 inserts from May Designs and one Moleskine. 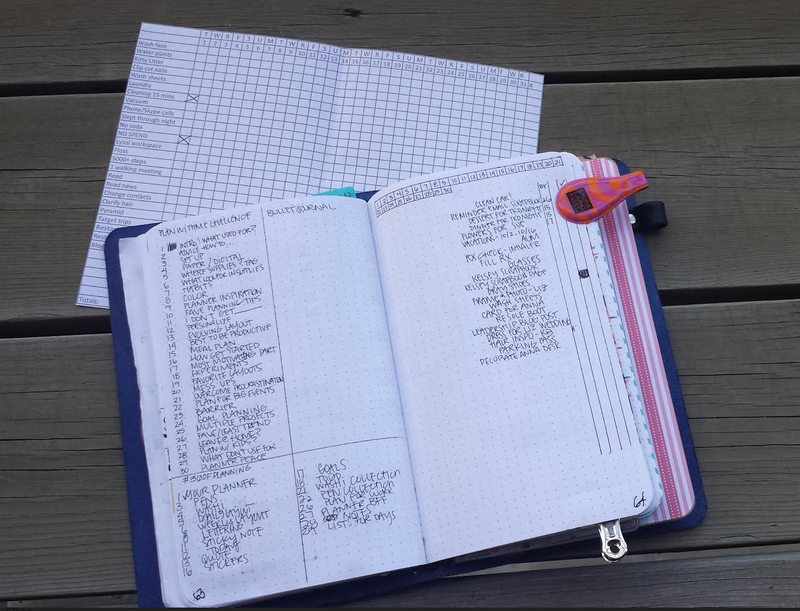 The first is a dotted grid for bullet journaling, the second is my attempt at a daily log, and a gridded Moleskine that houses my collections (durable lists like health issues, gift ideas, vacation planning, etc) and project notes. I also have a plastic pocket that has supplies like to-go washi tape, stickers, and sticky notes. It’s so nice having everything in one place. Personally, I’m not bothered by having work and personal thoughts and tasks mix – it is the nature of my world and it’s a hassle to think of something for home at work or vice versa and not being able to log it. Some of you know I gave up on using a monthly calendars because I never use them for anything despite best intentions – so I’m trying something new. On the right is a monthly task list, inspired by Dee (@DecadeThirty). I added a column for intended due date just in case there is a time frame for tasks. On the left is where I’ve started writing out different monthly Instagram challenges I’m participating in for easy reference. Behind that is a monthly habit tracker. This is my weekly layout- pretty and practical. I love using pretty things, so each week I choose different colors and use some functional stickers (from The Reset Girl, MilaPrintShop, and PeacefulMindDesigns). I’m using Dee’s hand-drawn Date Buttons with brief weather up top (because Minnesota weather is nuts and my outfits were failing me). I need the weekly view to see how my time builds and connects across the days – little tasks pop into my head all the time and I need to capture them for the relevant days. As you know, I use Google Calendar so you only see tasks in the column. The rows beneath serve different purposes depending what I feel like – here, the second row is a daily habit tracker. I wanted to track liquid intake, my steps, the number of unhealthy choices I make (as a deterrent! ), as well as the completion of my daily log, habit tracker, and expense tracking. I hope to keep it this many or fewer to keep it manageable. The last row is for my Instagram and blog planning. Who knows if this will stay if I keep track of them in my monthly! That’s what I love about this system – I can experiment. On the left I washi-taped a Russell + Hazel to-do notes that fold into my insert. I have a lot of reading to catch up on to prepare for a class I’m learning to teach next week, so this fold-in sticky note will follow me week to week to nag remind me to do it. I’m teaching two classes that begin next Tuesday – so we’ll see how I’ll need to adapt. Any other college instructors use the bullet journal system? What is your strategy? Here’s to September!